To make government accountable to the public, the Assembly committees have active role to play. 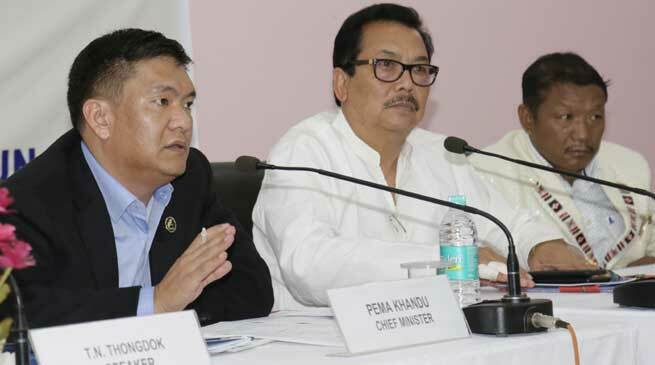 Without it the vision for ‘Sabka saath, sabka vikaas’ cannot be met, said Chief minister Pema Khandu in a Conference of Chairmen of Assembly Committees. Khandu on Wednesday chaired the conference of chairmen of Assembly committees for revamping the committees of Arunachal Pradesh Legislative Assembly. The Chief Minister thanked Speaker TN Thongdok for conducting the eleventh session of the sixth Legislative Assembly smoothly and for organising the conference of chairmen. Khandu appreciated the conference as timely exercise and said that proposed revamp of Assembly committees is a reasonable one and needs to be expeditiously carried out. He requested that MLAs be trained in their roles and functions and also orientation programmes be conducted for chairmen and members of the committees. The conference was attended by ministers, parliamentary secretaries and MLAs.